This album that was released in early autumn of 1974 is one of the best albums ever made in rock music. As also its title shows – that is supposed to invoke Bob Dylan’s song, Desolation Row – its main topic is the disappointment, desolation and bereft of hope of people. As compared to its predecessor, Sweet Fanny Adams that has been released a bit more than half year before and has been considerably more extrovert album, Desolation Boulevard is more intimate, personal and musing. Neither of the songs of Sweet Fanny Adams can be imagined to include on Desolation Boulevard and it is valid conversely also. The SWEET brought a completely new colour into hard-rock: before it the hard rock has never sounded in a soft, warm and musing way like this that is even very hard in the same time (though it seems to be contradiction at first). One can speak about the minute processing of the compositions only in superlatives: full and robust, but in the same time clear and engineer-like prcise bass, the sharp but still full and warm electric lead guitar sounding, besides which beautifully chiming acoustic guitar runs, and the drums that never ring with evident rhythming and it is impossible to predict in any moment how they will colour the music in the next moment. The album is very textured both in musically and sounding and – due to in considerable part to the sound engineering – has a very orotund tone. Brian in his lead vocals positively tells the songs and his emotional vibrations are always exactly captured. The well-known SWEET choir beautifully and excitingly rings and perfectly meets the music. The album includes 9 pieces in a sequence that has been perfectly selected. Though each track is considerably different, the Desolation Boulevard has a very solid, uniform atmosphere: neither of the compositions can be imagined to be on any of the other SWEET albums. It is one of the most superb piece of SWEET’s career. This strongly dramatic song has a disappointed feeling with dreaming surreality. It uses the young ones’ feeling in the period after the students’ revolt in 1968 as symbol to show the feeling of disappointment, desolation and emptiness that anyone of us can feel in a situation („…when Bobby and Billie thought that sixty eight is out of date/They took the flowers form their hair/and tried to make us all aware too bad too late”).. It is very compelling and impressive that how the hard electric guitar voices can come into harmony with the chiming acoustic guitar voices. Brian’s performing the song as if a contemporary bard was telling a tale, with an excited, choking voice. The balladistic intonation is very well mixed with the style charcteristics of music far from it. The last line of the refrain preparing parts sung by Steve perfectly fits the whole stream in every case. Each verse is different in its tune and the part that is following the accelerated instrumental middle section is even speedier. This speedier rhythm is intensifying the feeling of distraction. The unpredictablity inside the song makes the listening of the song particularly exciting adventure. The peak of the song is before the instrumental movement yet, when Brian and Steve is singing the bridge of the second strophe in duet with despondency full of tension that is intensified by the electric guitar that is twanged by blustering. These four lines that have become legendary are quoted on the back cover: „Oh they would walk the strip at nights/And dream they saw their name in lights/On Desolation Boulevard/They’ll light the faded lights”. Though the refrain has a bit more hopeful feeling, it does not decreases the tension considerably. A further glorious song that is one of the most outstanding songs of the album. It is talking about the duality that can reside in any woman („Heart of a woman/But she’s a child/Something inside that’s gonna drive you wild”). It is starting with a short overture fantasy in which the bass-drum duet is replying to the starting voice of the electric guitar. The next part that is an introducing part of the first two strophes and is appearing at the end has a very strong and characteristic riff that, except these three cases, cannot be heard in any other part of the composition. This increases the manifoldness of the song. It is exciting that each strophe is sounded completely differently. The first one is sung by Andy with the background of ethereally fine, vibrating guitar twangings and the others are sung by Brian The third one is backgrounded by drastic twanging of deep voice electric guitar that is giving restless feeling to this verse. Steve is performing the bridge by almost rapping. The instrumental movement is fantastic. Its first part is a fine, airy jazz-rock. As starting dismembered, crackling guitar voices are playing a playfully zigzagging melody to the base given by the broken bass voices that fit well the electric guitar and the fine percussions. This theme, by gradual deepening, is altering to slow hard rock. Andy’s accompanying guitar sound is sharply full and is sounding very hard, but is not hustling. The song is ending with a hard close-up that is preceded by a reverberated guitar theme. It is a very hard, slow hard rocker that has a relatively simple structure. Brian is singing it, almost in Bob Dylan’s talking style. The bridge is sung by Steve here also and again by rapping that can be heard in the previous piece. Andy’s guitar is thundering all along the song with infernal hardness. This piece is one of the most outstanding artwork in rock music’s history. Andy Scott has composed it by himself. The weird and bizarre atmosphere is not unintentional: Andy is invoking the Medusa, a nightmarish character of the ancient Greek mythology, but not in the usual way: it is a song about someone who is able to make the Medusa turn to stone, if it gazes upon him („Oh Oh let my myth surround the twilight zone/Those who gaze upon me/Turn to stone/Turn away before YOU turn to stone/Medusa, Medusa”). The nightmarish feeling is easing a bit in the instrumental movement only, during listening to which even the jazz-rock fans can click. The pushing monotonity of the acoustic guitar is emphasizing the depressing feeling. Brian’s lead vocal is almost lost in the monotonous acoustic guitar led music as if he was singing out from the other world or from a dream. When the drum is entering the song by joining in the deep-piano-voice-like bass of Steve, the rhythm is becoming strangely lame. It is slipping just a bit only like the entering choir, but they together are enough to increase the floating of the musical action. The choir is brilliant as sounding in more and more wider interval during the refrain and reaching its peak in the end, in the „Medusa, Medusa” but is fulfilled in the second „Medusa”. The instrumental theme is starting by slow, ritual-like deep drum beatings and then acoustic guitar twangings of the same rhythm is entering to them. From this motive a fascinating jazz-rock trio is evolving for electric guitar, bass and drum. Mick’s drum is giving the rhythm by speedy variations that are almost impossible to follow, Steve’s breath-taking bass is improbably twisting up and down, and Andy’s vibratingly swirling guitar improvisation is added to those mentioned so far. It is one of the most brilliant and captivating rock music movements of all times. It shows well how high SWEET was skilled and I wish each SWEET fan the interesting personal experience to see the face of a listener during this part who has met the well-known SWEET hits only up to then. A merciless tympani voice is ending this wonderful composition appearing from the refrain. Thank you very much for this magic, Andy Scott! After the previous actions solely a lyrical composition can close the first side of the album. It is Andy’s work also and even sung by him. It is always a big celebration when he sings the lead vocal because we cannot hear so frequently his particularly unique voice as lead vocalist. It is a love ballad whose instrumentation is extraordinarily exciting despite the basic instruments of rock music are used only. It’s a beautiful song whose lyrics have double meaning: it is about a lady who is beautiful like the starlight, however about the starlight that is personified as a beautiful lady. In the beginning Andy is accompanying himself with acoustic guitar, then entering is Steve’s improbably deep and spreading bass, Mick’s slow drumming and Andy’s electric guitar twangings that are ringing long. Andy’s incredible genius is proved by the closing guitar voices that are fine, musing, meditating and indulging in reveries. And if we thanked Andy the magic for the previous song, now we have to repeat it. The listener is so enchanted by this closing that persuades himself or herself to rise from the armchair to turn the record. We, who have Desolation Boulevard on vinyl, are luckier than those who have it on CD because this interruption is needed for getting back from the tales’ empire to the true world before the further actions. The listener obviously was short of breath due to the exciting and variable music of the first side of the album, and now here is an additional amazing surprise. The work of Elmer Bernstein and Sylvia Fine was arranged by Mick Tucker in 8 and ½ minutes- brillantly! It is starting by hard brass orchestra and is remaining instrumental all along, except a short section where Mick is screamingly singing that „Watch that man with the golden arm!” . If he did not attract our attention, we would still notice and recognize that the arms of that man are from gold, because soon is starting one of the most fantastically composed and structured drum solos ever. It is not positively a rock drum solo, but is somewhere on halfway between a rock drum solo and a contemporary percussion piece. Its build-up and its precise composition exceeds the usual rock drum solos. Mick is magnificently exploiting the possibilities given by the numerous kinds of percussions (several kinds of drums, double foot drum, tympani, tubular bells, gongs), but nothing is exaggerated. It is unique, for example, when, in one of the movements, the beginning riff of the composition is appearing by being played on bells. Many kinds of feelings are changing each other from the rapid virtuoso parts to the fine percussion fantasies. At the end the brass orchestra is returning and is closing the piece with earsplitting voices. In each cases when I have showed this piece to progressive rock fans and asked them to find out who was playing, they were not able to recognize. They had ideas, for example Ginger Baker, but they felt that they are wrong, because the style is completely individual. When I have said them the name, they were very surprised that the man with those golden arms was Mick Tucker from SWEET. The listener’s heart sinks because of the arranger and performer of this fascinating piece has not been between us already. If far more rock fans knew this piece than how many have known, Mick would have already taken his place long ago in the drummers’ pantheon together with, for example, Ginger Baker. Those who knows the single version of the songs are surprised enough, because, except the melody, almost everything in this version is soundig differently from it. Here a weighty progressive hard rock song can be heard whose instrumentation is far from the single version that was made to become hit. Steve’s usual robust bass is sounding like he was playing solo that is giving a very exciting base with Mick’s continuously vibrating drumming full of variations. Andy’s guitar is splendidly dubbing Brian’s vocal; stirring but is remaining in the background. The whole song is sounding weighty, we feel it twister despite the non-rapid tempo. Steve is singing one line per refrains here also in addition to the choir. In the middle insrumental part again all three musicians are playing almost solo, but the music is still held together cleverly. It is not known whose idea was to put this song on this album, but this song rather decrease the value of this record than would increase it. 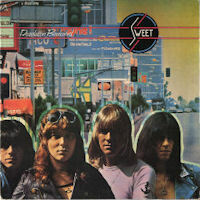 The reason is surely evident: it is a tribute to the WHO with whom SWEET had good connection and who have invited SWEET to join in them to play a gig about half year before releasing this album. And the main problem is not the song itself, what is more: SWEET’s version is, in my opinion, better than the original one that is not usual in case of coverings. But there is another problem with this song, in addition to that it does not fit in the atmosphere of Desolation Boulevard (but fits better than Peppermint Twist did in Sweet Fanny Adams), namely that SWEET, musically, add almost nothing to the original one, because is playing it almost in the same way like WHO have played it. In any case it does not cause big trouble, because they are playing it well and this album is so incredibly superb that can be characterized as perfect even with this fault.